BAE Systems has announced its plan to shutdown Portsmouth shipyard in the UK as part of the government’s naval restructuring programme. The historic shipyard will be closed by the end of 2015. This move will affect almost 1,800 jobs, including 940 jobs in Portsmouth. A further 835 jobs, mostly in Glasgow, but also in Rosyth, near Dunfermline and Filton, near Bristol, will be axed. UK Defence Secretary Philip Hammond said Portsmouth’s shipyard shutdown and the job losses were a harsh blow, but it represented the best decision in the national interest. The decision to cut jobs follows completion of work on the Royal Navy’s new Queen Elizabeth-class aircraft carriers and is also attributed to lack of future orders for the company. A BAE Systems spokeswoman said the company and the Ministry of Defence (MoD) will continue to work closely to explore all possible options to determine how best to sustain the capability to deliver complex warships in the UK in the future. "This work is ongoing and we are committed to keeping our employees and trade unions informed as it progresses," the spokeswoman said. "To offset the effect of the job cuts, the UK MoD and BAE have jointly announced measures which include investment of more than £100m to expand the dockyard at Portsmouth." 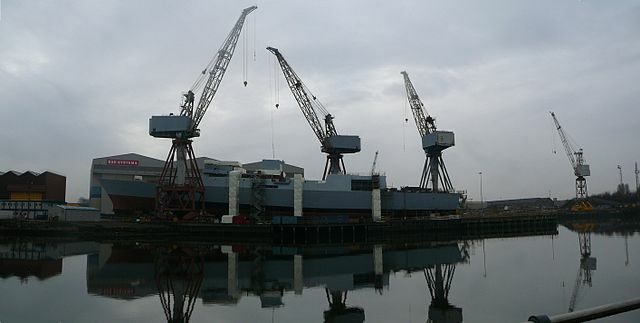 Early next week, the Confederation of Shipbuilding and Engineering Unions and senior BAE systems executives will discuss to examine the business case of the impending announcement on jobs. To offset the effect of the job cuts, the UK MoD and BAE have jointly announced measures which include investment of more than £100m to expand the dockyard at Portsmouth. Three new ocean-going offshore patrol vessels will also be built at BAE’s Govan and Scotstoun yards in Glasgow for the Royal Navy. Until the work begins on the Type 26 Global Combat ships, the measures are expected to help sustain shipbuilding at the yards. Meanwhile, Downing Street sources said that the plan to stop shipbuilding at the BAE dockyard in Portsmouth will be reversed if Scotland votes for independence. Image: Royal Navy’s Type 45 vessel stationed at BAE Systems’ in Govan shipyard. Photo: file image.